The information in this mailing relates only to ICD-11, the revision of ICD-10 scheduled for completion and pilot implementation in 2014/15. It does not apply to the forthcoming US specific “Clinical Modification” of ICD-10, known as ICD-10-CM. An ICD Revision Process Alpha Evaluation Meeting was held in Geneva, last week, between 11-14 April, for discussing the status of the revision of ICD-10 and development of ICD-11, for both content and software development, and reviewing the ICD revision “Roadmap” and Timeline. A copy of the Meeting Agenda can be downloaded from the ICD-11 Revision site here or opened on DSM-5 and ICD-11 Watch site here: ICD11 April 11 Meeting Agenda. There are some interesting comments in the Agenda Appendix on project funding, lack of resources, project management and lines of communication. 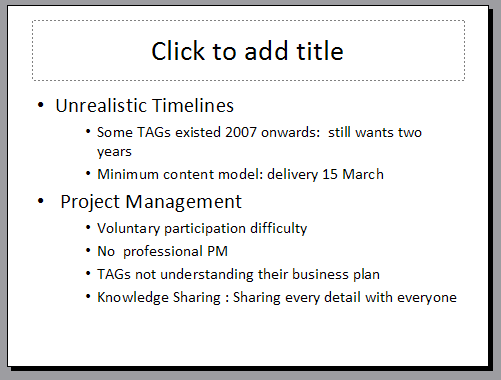 There are five PowerPoint presentations available to download from this page. If you are interested in the ICD Revision process, in general, then I suggest visiting the site and viewing or downloading the following three presentations – these are slides only, with no notes or transcripts. In mid 2009, ICD Revision launched a number of platforms as channels of communication with the public and maintains a YouTube Channel, Facebook site, Twitter and blog. The ICD-11 blog has not been updated since October 2009 and queries left on the Facebook site by members of the public may take several months before a response is provided or may receive no response, at all. The YouTube videos made to accompany various Geneva meetings can also be accessed on the ICD Revision YouTube page of my site. 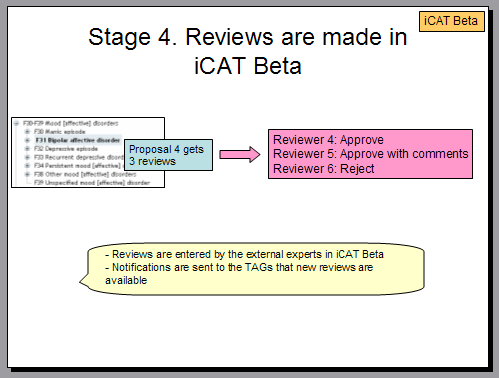 The two most recent videos give an overview of the iCAT drafting process and the extent of the ICD-11 “Content Model” – the 13 parameters through which ICD-11 categories can be described. 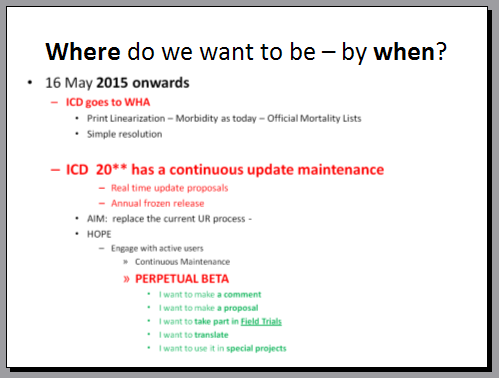 Following last week’s ICD Revision Process Alpha Evaluation Meeting, it is anticipated that ICD Revision may make a public announcement, within the next few weeks, clarifying how it intends to proceed in light of the fact that the timeline for the Beta drafting phase is slipping. 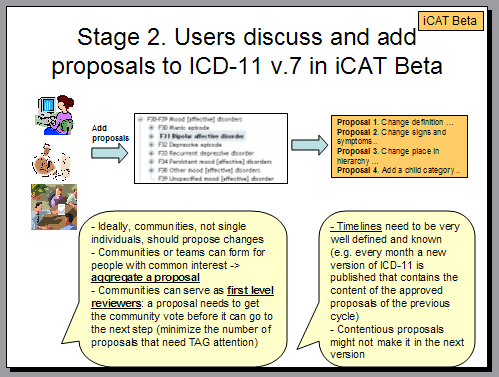 The meeting Agenda and PowerPoint slides suggest that ICD Revision is working towards making a version of the drafting platform publicly available around 16 May, this year, but that this may represent a compromise on previous plans and may be a “hybrid” between the Alpha and Beta drafting phases. Earlier timelines had projected endorsement by the World Health Assembly (WHA) and pilot implementation of ICD-11 in the spring of 2014. But one presentation slide suggests approval by WHA in 2015. It’s unconfirmed, but if the “Milestones” timeline has been revised to accommodate a later release of a Beta drafting phase platform and later publication of a Beta Draft, then WHO may have already decided to shift the pilot implementation date for ICD-11 by 12 months, to 2015. That would mean that by the time ICD-11 is ready for dissemination, the American Psychiatric Association’s DSM-5 would have already been put to bed and out in print two years prior to ICD-11 implementation. It is intended that for ICD-11, all three volumes will be electronically published and capable of continuous updating in response to scientific developments (unlike ICD-10 where there are annual updates); there will also be electronic translations and print editions. The three volumes of ICD-11 are intended to be integrable with each other and also with some other classification systems. The drafting platforms are based on Web 2.0 applications and it is proposed that there will be stakeholder and end user participation in the Beta drafting phase. 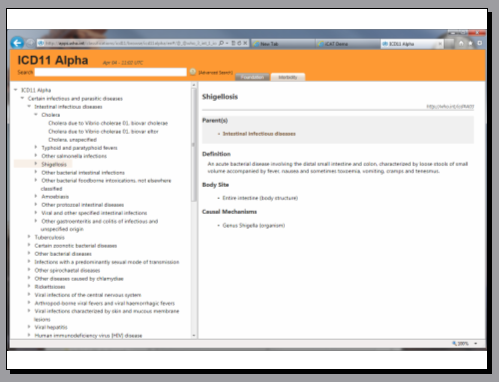 The IT work and software development for the various alpha and beta drafting platforms and final product platforms is enormously complex; there is also the potential for far more textual content in ICD-11 than there was in ICD-10 and overall, this revision project represents a huge undertaking by an under-resourced organization. 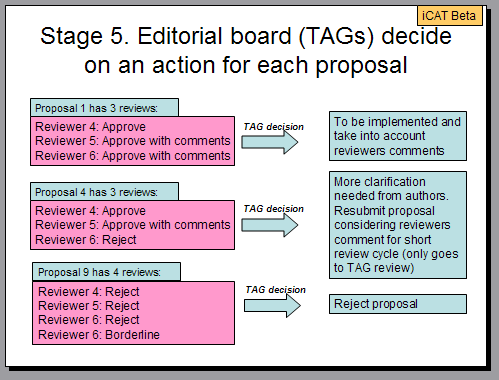 Topic Advisory Group (TAG) Managing Editors overseeing the revision of the various chapters of ICD-10 have responsibility for recruiting external experts, via networking. The function of the external experts is to peer review proposals being made by TAG members or submitted by external professional bodies and institutions and to review or assist with the generation of textual content. 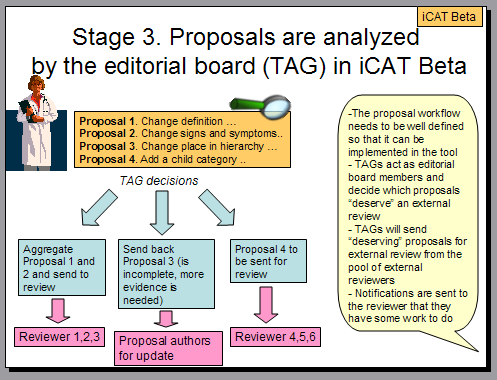 So there are many lines of communication to be maintained between WHO classification experts, IT consultants and technicians, Revision Steering Group members, TAG Managing Editors, TAG members and external experts. There is an ICD-11 Collaborative Authoring Workflow chart here: workflow-2. 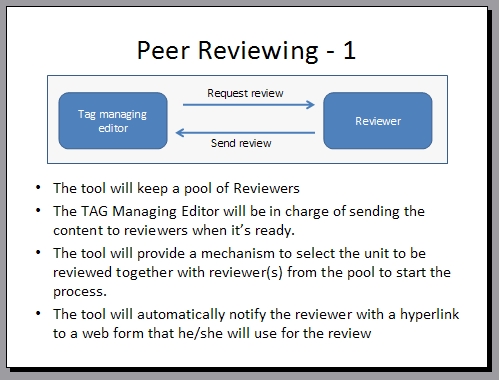 At the Beta drafting stage, the proposal is that TAG Managing Editors will continue to recruit external peer reviewers to assist workgoups with reviewing of categories, proposals and generation of content, but that versions of the Beta drafting platform would be opened up to the public for viewing, and interested stakeholders would be able to register for limited input and interaction. 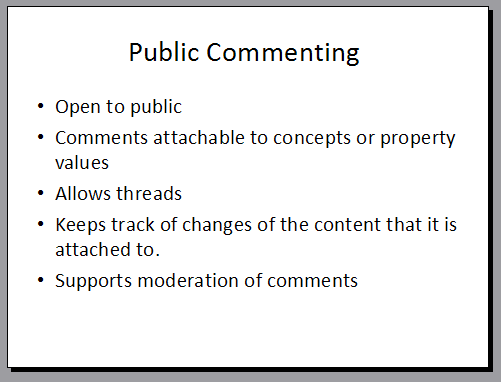 Stakeholders (or preferably, communities of stakeholders) would not have editing rights, per se, but the proposal is that they would comment on proposals, “score” proposals and make evidence-based suggestions which the TAG groups would then consider for approval, which would then be incorporated into the draft or rejected. There has also been discussion of a “hierarchy” of levels of input according to professional status of stakeholders. How ICD Revision plans to verify the credentials of professionals isn’t clear, nor is it defined what would consitute a stakeholder “community”. 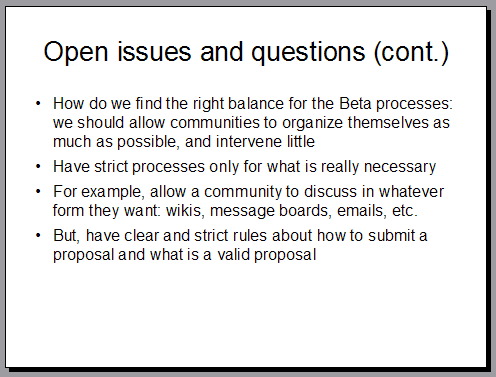 Rather than release a static Beta draft for professional and public scrutiny in a feedback exercise for a pre-determined review period (as DSM-5 has already done and is scheduled to do again in August-September), the proposal appears to be for longer term feedback during an alpha/beta transition drafting phase on dynamic content that would be continuously updated, for example, on a four weekly cycle, to reflect the progress being made by the various Topic Advisory Groups in entering proposals for changes and populatation of textual content, and in response to external input. So managing editors and members of the Topic Advisory Groups (mostly international clinicians and researchers juggling this work on top of their “day jobs”) are faced with maintaining lines of communication, largely via electronic means, between workgroup chairs, fellow workgroup members, external peer reviewers and WHO classification experts whilst also considering input from professional bodies, and working in the background on the drafting platform, while stakeholders are commenting and feeding suggestions into the process via the public versions of the drafting platforms. ICD Revision and its IT and informatics advisors seem eager to use these internet applications because they exist, without having given due consideration to whether the WHO can fund, manage and sustain this level of public participation and interaction or whether this is the best way to approach the revision of the ICD. 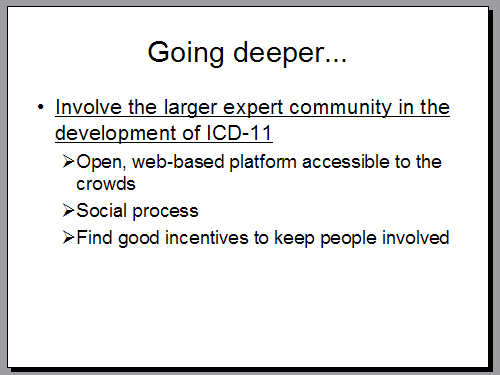 How does ICD Revision intend to finance and recruit the personnel needed to manage the opening up of the drafting process to multiple platforms for stakeholder participation, given WHO’s limited resources when already, no-one can evidently be spared to even keep the ICD-11 blog updated or to respond to queries that members of the public have posted on ICD Revision’s existing public platforms and where Topic Advisory Group Chairs approached for brief clarifications are not always providing a response nine months down the line? Who is going to pull this most ambitious project back down to earth? Until some form of Alpha/Beta transition drafting platform is back in the public domain, it won’t be evident how much further forward the population of content for Chapter 6 Diseases of the nervous system has progressed since last November. As more information becomes available, I will update, and I will be posting a summary of how things stood in the iCAT last November in Post #72. 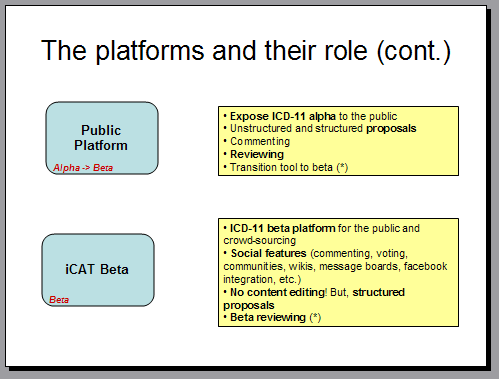 6] Closing remarks, PowerPoint presentation: “Proposal for the ICD Beta Platform”, Stanford team, 12.04.11, WHO, Geneva. There will be no public review of revised draft criteria for DSM-5 categories this coming May. APA Field Trials got off to a late start and the DSM-5 timeline continues to slip. Online posting of draft disorders and criteria proposed by the DSM-5 Work Groups for new and existing mental disorders had been scheduled for May-July, this year. Revised criteria were expected to be posted online in May, for a period of approximately one month to allow the public to review proposals and submit comment. There are also references within the DSM-5 Timeline to ICD-10-CM and the forthcoming ICD-10-CM Partial Code Freeze, and to ICD-11. 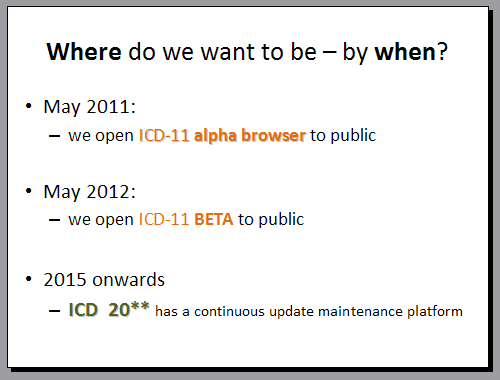 According to sources, ICD-11 Revision Steering Group are still working towards having a Beta Draft ready for May 2011. But from a PowerPoint presentation posted briefly on the ICD-11 Revision website at the end of February, but swiftly removed following enquiries, evidently the WHO has been discussing the pros and cons of postponing the release of its own Beta Draft for public input until the autumn, or until the end of 2011, or possibly even May 2012. 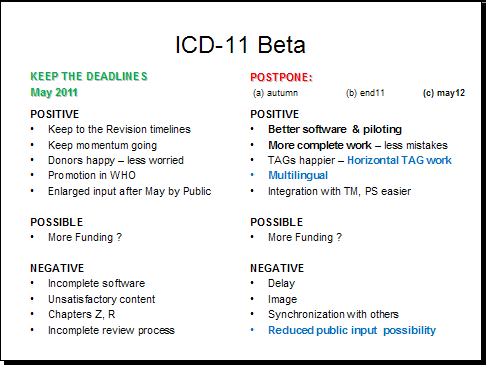 Another ICD Revision document: ICD Revision Project Plan v 2.1, projects a date of May 2012 for release of the Beta Draft. 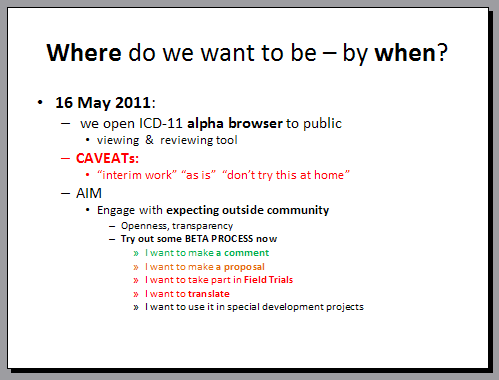 Since there is no definitive and recent ICD-11 timeline on any of the WHO’s ICD Revision sites, and since ICD Revision is keeping schtum, it remains unclear at what point in the timeline a Beta Draft for ICD-11 will be released for public scrutiny and input (as opposed to purely internal use, as the Alpha Draft had been). I will update when more information becomes available. The original dissemination date for ICD-11 had been 2012, with the timelines for the revision of ICD-10 and DSM-IV running more or less in parallel. But in 2007/8, the release date for ICD-11 was shifted to pilot implementation in 2014 and dissemination in 2015. A “pre-final draft” of ICD-11 is projected for March 2013 with submission for WHA endorsement in May 2014. ICD Revision are balancing “incomplete software, unsatisfactory content and incomplete review process” against reduced opportunity for public input and reduced public confidence, if the timeline for the Beta were to be extended. In December 2009, the APA announced that the publication date for their DSM-5 was being extended to May 2013. With a Partial Code Freeze looming this October for ICD-10-CM, the delays in starting field trials and now a three month postponement of publication of revised criteria for the second public review and comment period isn’t going to inspire confidence in a Task Force that has already come in for significant criticism of its oversight of the revision of DSM-IV. The APA participates with the WHO in the “International Advisory Group for the Revision of ICD-10 Mental and Behavioural Disorders” (Chapter 5) and a “DSM-ICD Harmonization Coordination Group”. But the WHO acknowledges there may be areas where congruency between the two systems may not be achievable. As the iCAT (the ICD-11 electronic collaborative drafting platform) stood last November, two new categories were listed in the Linearized Chapter 5, F45 – F48.0 (Somatoform Disorders) codes. It is understood from ICD documentation (DIFF File – Changes from ICD-10 [MS Excel doc. Retrieved 29.09.10; no longer available on 01.10.10]) that child categories F45.40 and F45.41 are new entities for ICD-11 . 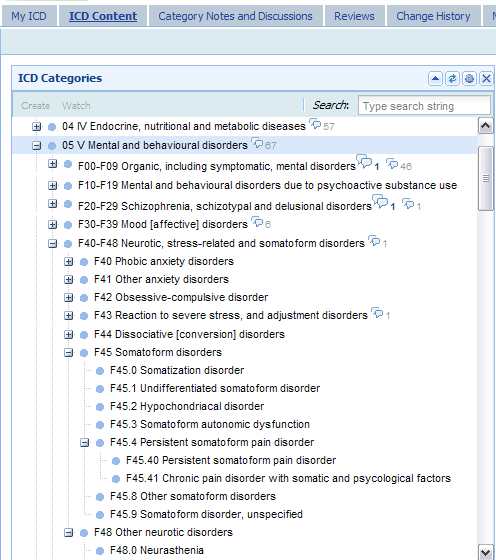 Note the ICD-11 categories between F45 – F48.0, as they stood in the iCAT drafting platform last November, do not mirror current proposals of the DSM-5 “Somatic Symptom Disorder” Work Group for renaming the “Somatoform Disorders” categories of DSM-IV to “Somatic Symptom Disorders” and combining a number of existing categories under a new rubric, “Complex Somatic Symptom Disorder (CSSD)”, and the more recently proposed “Simple Somatic Symptom Disorder (SSSD)” . 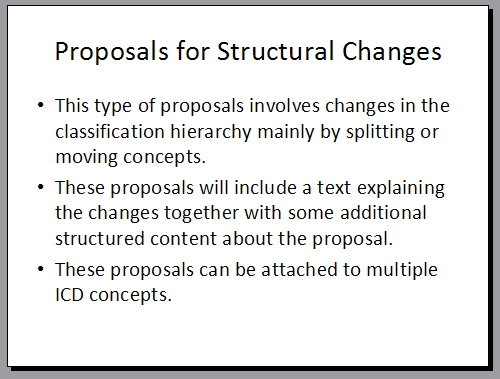 A more recent version of the Content Model document was uploaded to the ICD Revision site on 22 February. A revised version of the ICD-11 Content Model Reference Guide was uploaded to the WHO’s ICD Revision Google site in January. This version of the document, dated 27 January 2011, replaces previous versions on DSM-5 and ICD-11 Watch site and on the ICD Revision Google site. This Reference Guide is intended to define and explain the Content Model used in the ICD-11 alpha draft in practical terms. It aims to guide users to understand the purposes and parameters of the Content Model. 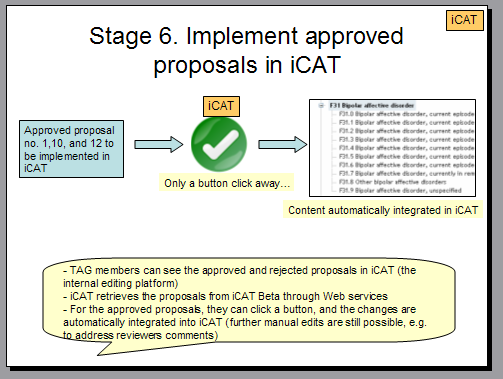 The Reference Guide also informs users about the technical specifications of each parameter which the designers of the iCAT (the computer platform that is used to fill in the content model: international Collaborative Authoring Tool) took into account in building the software. The purpose of this Reference Guide is to ensure that the Content Model and its different parameters are properly understood. This document will be periodically updated in response to user needs and evolution of the content model. The International Classification of Diseases (ICD) is the global standard to report and categorize diseases in order to compile health information related to deaths, illness and injury. The ICD content includes diseases and a range of health problems including disorders, syndromes, signs, symptoms, abnormal findings, complaints, social circumstances, and external causes of injury. The ICD is designed to promote international comparability in the collection, processing, classification, and presentation of these statistics. 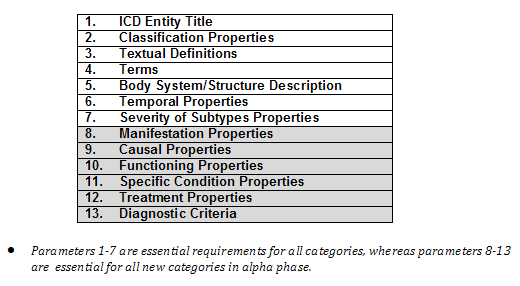 In ICD there are multiple classification categories which are defined by explicit or implicit parameters such as: codes, titles, definitions and other characteristics. 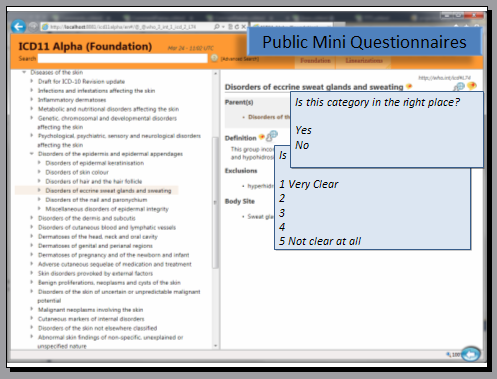 In ICD 11, we aim to formally represent all this classification knowledge in a systematic way. The Content Model serves this purpose. What is the “Content Model”? The Content Model is a structured framework that defines “a classification unit” in ICD in a standard way in terms of its components that allows computerization. A “model” is a technical term that refers to a systematic representation of knowledge that underpins any system or structure. 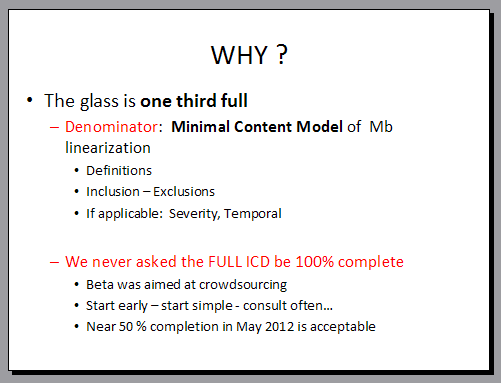 Hence, the content model is an organized description of an ICD unit with its different parameters. In the past, ICD did not explicitly define its “classification units” – in other words diseases were classified without defining “what is a disease?” (There have been efforts to provide some definitions, inclusions, exclusion information, and some coding rules in the instructions and in the index. Some chapters, such as mental health, oncology, or other groups of diseases have been elaborated with diagnostic criteria. All these efforts may be seen as implicit modelling.) 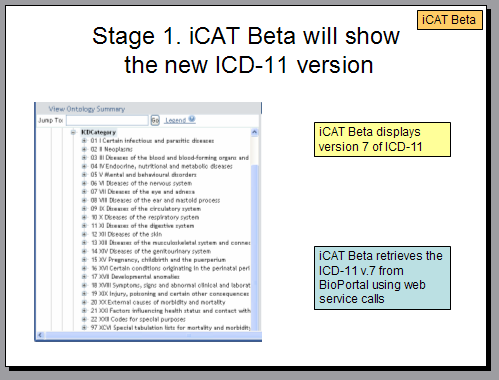 In the ICD 11 revision process, deliberate action is being taken to define the ICD categories in a systematic way and represent the classification knowledge to allow processing within computer systems. Then the key components of this definition have been operationally defined as different parameters which, as a whole, formed the Content Model. A classification unit in ICD is called an “ICD entity”. In other words, any distinct classification rubric is called an Entity. (The term “Entity” is used interchangeably – in the same meaning — with the term “ICD Concept”. A category (which is the most common reference to an ICD class) may be a disease, disorder or syndrome; sign, symptom or other health problem such as injuries, or a combination of the above. In addition, ICD has also been used to classify “external causes” or “other reasons for encounter” which are different kinds of entities than the diseases. In other words, “Category” refers to the individual classes represented in the ICD-10 printed version. The Content Model, therefore, allows the various classification categories to be represented more clearly so that users can identify the classification units in a scientific fashion. The purpose of the content model is to present the knowledge that lies under the definition of an ICD entity. 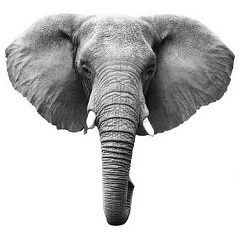 Each ICD entity can be seen from different dimensions. The content model represents each one of these dimensions as a “parameter”. 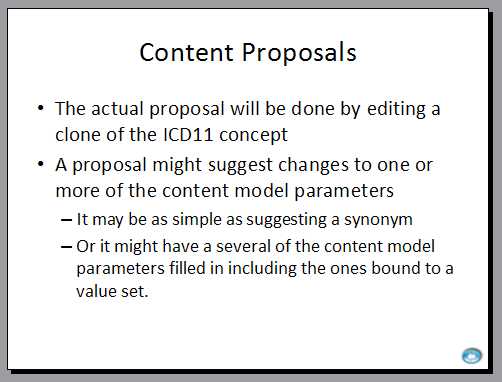 For example, there are currently 13 defined main parameters in the content model to describe a category in ICD. Signs/symptoms Crushing chest pain, etc. It is not necessary to describe all categories with all parameters. 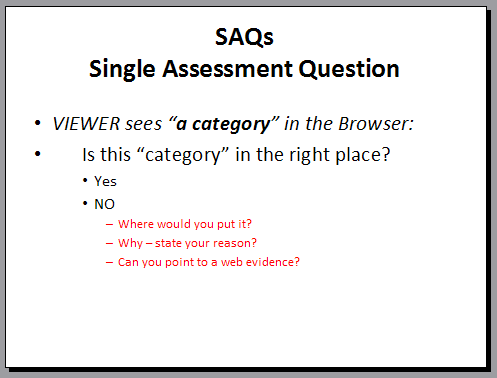 Only parameters that are relevant to the description of the category should be used. In certain instances such as External Causes, only a number of the parameters are valid for the description of these entities. The full range of different values for a given parameter is predefined using standard terminologies and ontologies. 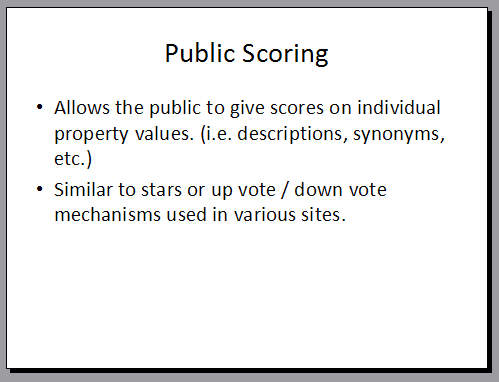 The predefined values constitute a “value set”. The 11th revision of the International Classification of Diseases and Related Health Problems (ICD) will be developed as a collaborative effort supported by Webbased software. 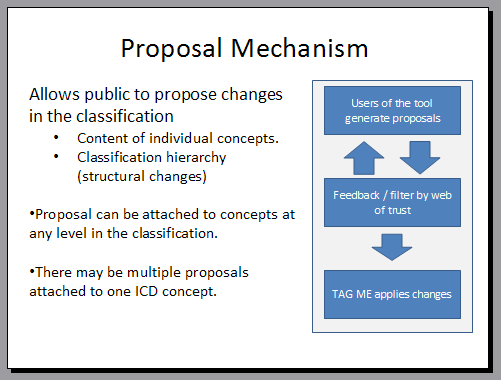 A key to this effort is the content model designed to support detailed description of the clinical characteristics of each category, clear relationships to other terminologies and classifications, especially SNOMED-CT, multi-lingual development, and sufficient content so that the adaptations for alternative uses cases for the ICD – particularly the standard backwards compatible hierarchical form – can be generated automatically. 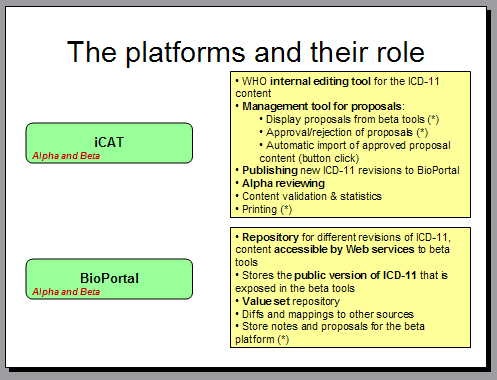 The content model forms the basis of an information infrastructure and of a webbased authoring tool for clinical and classification experts to create and curate the content of the new revision.